EXPLORING AUDIENCES’ ENGAGEMENT THROUGH PARTICIPATORY WORKSHOPS AT MSI MANCHESTER. Our project assisted MSI in their Heritage Lottery Fund bid for the future development of the content of the galleries over the next ten years. We specifically addressed the current Textile Gallery at MSI and aimed to reinforce the need for gallery redevelopment. During the research process we generated a creative opportunity for target audiences to engage with the current Textile Gallery and unseen archival material(s) in relation to specific objects, stories and interpretation methods by measuring levels of engagement during the participatory workshops. Through this method we established two types of data: visual and narrative. This qualitative approach was suitable for gathering meaningful, rich information; building on MSI’s already existent audience categories. Using qualitative tools to address the visitors’ experiences in museums was vital in developing an integral information baseline about MSI audiences. A qualitative approach sheds light about preferences, uses, meanings, and appropriation. In order to explore engagement, we used the General Learning Outcome scheme as it provides five dimensions: enjoyment, knowledge, skills, attitudes and progression. 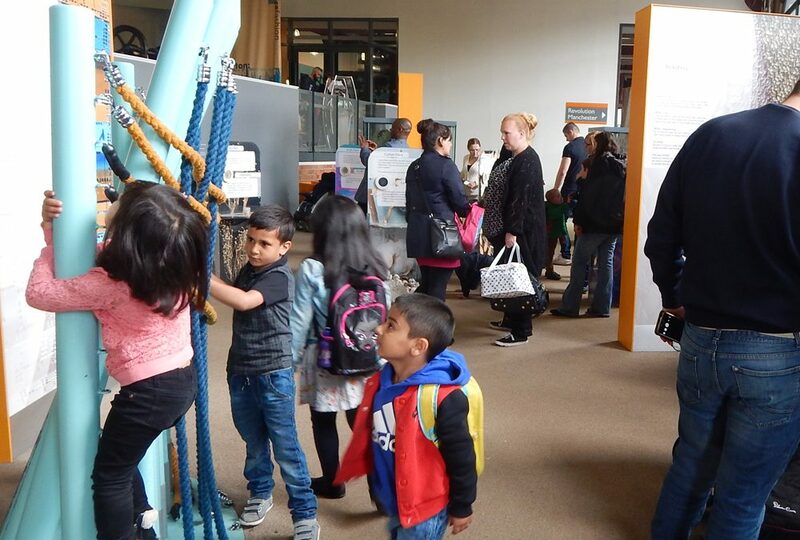 In the museum experience, engagement has also been linked to being enthusiastic, energetic, passionate, taking responsibility for the own learning experience, autonomous, purposive; it is more related to motivation rather than fun. Following this we translated and disaggregated these dimensions and concepts into an empiric tool to explore engagement in this particular setting. Focusing on the three sub-dimensions of engagement for this study: participation, narration, skills and meanings. All of these sub-dimensions are easy to match with the proposed research techniques and are also related to each other. As a result, we were able to produce a vibrant illustrated report that gives a deeper insight into the thoughts and feelings from visitors at MSI surrounding current levels of engagement in the Textile Gallery. Also, we were able to provide further data on the archival material present at MSI and how the engagement directly with objects provoked very personal responses in the outlined workshops. Working with an external partner is always an interesting experience; combined with working with another PhD researcher from a different discipline provides an exciting environment. Its also a valuable learning process working with new disciplines as they provide insights into new ways of seeing, thinking and meanings in specific contexts. The REALab training programme that ran alongside the project provided useful sessions on community engagement, impact and consultancy related skills. It was particularly useful as it was held within a collaborative, interdisciplinary and cross-institutional environment. This atmosphere provided the opportunity for expert skill sharing to take place. It provides researchers with the opportunity to network, collaborate and develop as individual researchers as well.